Tech Junkie Blog - Real World Tutorials, Happy Coding! : SQL Server: The DELETE statement conflicted with the REFERENCE constraint "FK_Order_Details_Products". The conflict occurred in database "Northwind", table "dbo.Order Details", column 'ProductID'. SQL Server: The DELETE statement conflicted with the REFERENCE constraint "FK_Order_Details_Products". The conflict occurred in database "Northwind", table "dbo.Order Details", column 'ProductID'. This error occurs when you tried to use the default "DeleteStatement" generated by SQL Builder in Visual Studio 2013 for the "Products" table in the "Northwind" database. What it says basically is that the query is trying to delete a product that is being reference by another table call the "Order Details" table. The solution to the problem is to delete the child records in the "Order Details" table before you delete the record in the "Products" table. In this example the scenario is that we added a SqlDataSource control to our .aspx page and we used the auto-generated DELETE statements generated by Visual Studio. We click on the "Delete" link on our GridView and received the above error. 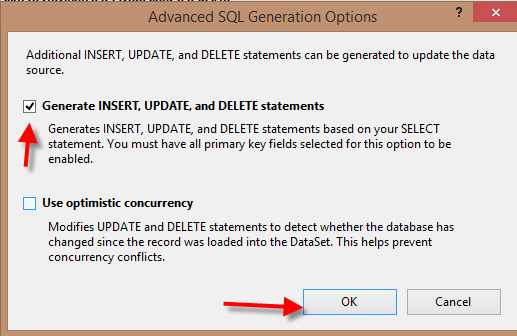 If you select the following checkboxes, you will get auto generated SQL statements for INSERT, UPDATE, and DELETE. The problem is the DELETE statement that were generated by Visual Studio only deletes the record in the Products table. The easiest way to fix this issue is to modify the delete statement that was generated by Visual Studio. What you want to do is delete the records from the lowest child level. Since the "Order Details" table is referencing the "Products" table we want to delete all the records associated with the record in the "Order Details" table first. DeleteCommand="DELETE FROM [Order Details] WHERE [ProductID] = @ProductID; DELETE FROM [Products] WHERE [ProductID] = @ProductID"
Now you can delete the "Products" record with no issue using the SqlDataSource control and a GridView control. There are more elegant ways of resolving this issue, however since this is a blog, we will implement the sitcom 30 minutes solution. The main purpose of this blog is to make the point that the reason the error occur is because there's a foreign key constraint violation. Which is a good thing, not all exceptions are a bad thing. You just have to handle it.